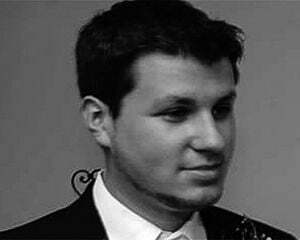 Call of Duty map packs are definitely a mixed bag. Fifteen dollars is pricey by any standards, and the prospect of one or two remade maps and a grand total of four arenas isn't anything to get excited about. Advanced Warfare's new Havoc DLC has just arrived this week on Xbox platforms, and it's par for the course in terms of what you'd expect. As usual though, zombies save the day. 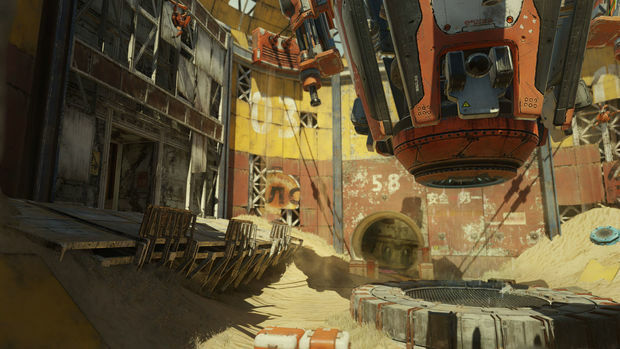 First up is Core, a yellow-toned map set in the Gobi desert. While the actual environment is plain, I really like the emphasis on more vertical movement as a result of the Exosuit. That mechanic alone has managed to differentiate multiplayer in Advanced Warfare from the rest of the series, even if Core only marginally takes advantage of that fact. It basically just Frankensteins a ton of different concepts together and hopes it works, like multiple tunnels that only stretch for a few seconds. It's a small and underwhelming arena but when it comes up I don't groan, so that's something good I guess. Urban is probably the coolest looking map in the pack, as it's the only one with a futuristic theme. Now all of the FPS genre's signature browns are subbed out for neon blue hues, and you'll definitely feel like you're playing something you paid a premium for. Having said that, the layout is a standard office/city theme, and there aren't enough windows to crash through or unique identifying aspects. That motorcycle in the picture above kind of just hovers there, and the map itself feels fairly static. Like Core though it's nice that it's in the rotation. 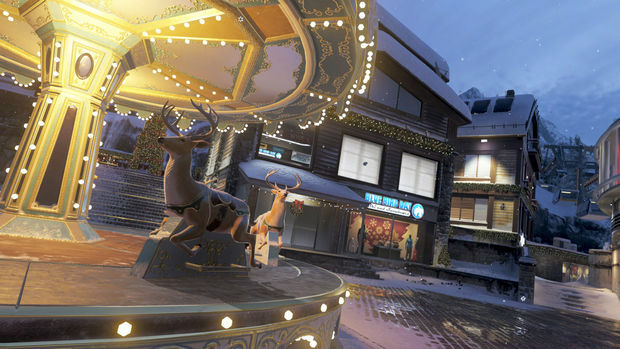 Call of Duty is no stranger to ski resort DLC, and here we go again. Drift is another medium-small map that features a hamlet town with a few diversions like a carousel. There's a few alleys to duck in and plenty of windows to crash through, but that's about it. Havoc's name of the game is underwhelming, through and through. I'm a sucker for snow maps, but this feels like something that should have been in the base game. I know it's important to not overdo the whole "future thing," but retreading doesn't really help the appeal of this package. 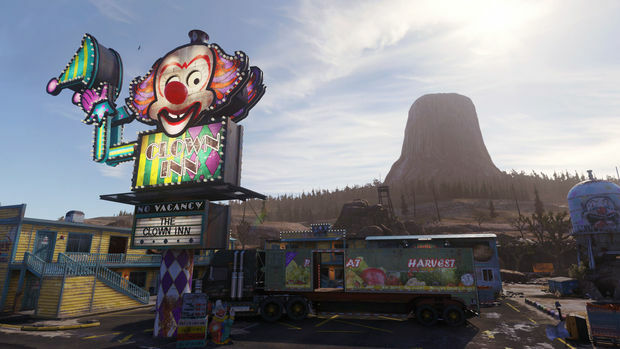 Sideshow is probably my favorite map of the pack, as it feels more like a Garden Warfare arena than a Call of Duty level. It has a rectangular symmetry to it, with a big open field in the middle and plenty of opportunities for cross-map shootouts. The theme is set to the tune of an abandoned township, but it also has an old-west field to it. I particularly like the fact that there was somehow a "Clown Inn" that existed somewhere that's creepy as hell. Every time I play this map it feels like everyone adapts to a new shooting style, which helps keep things fresh. Even then, Sideshow doesn't feel like something you'd pay for. Sick of zombies yet? I'm not! 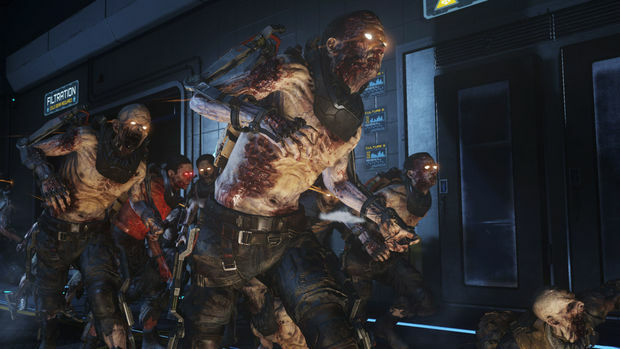 While the rest of the Havoc DLC is average at best, the new Exo Zombies mode single-handedly saves the map pack. Activision has opted to bring back a Hollywood cast, this time with Bill Paxton, John Malkovich, Rose McGowan, and Jon Bernthal. The prior holywood casts had horror (Gellar, Englund, Trejo, and Rooker), and mob (Palminteri, Pantoliano, Madsen, and Liotta) themes, but I think Havoc has the most interesting cast yet. While Paxton is probably the standout performance here, everyone in Havoc provides a good show. No one sounds phoned in, and they all seem like they're having fun. There's a short intro to help introduce the new pack of mercenaries, which are brought in to clean up a zombie mess Atlas started. It's a great way to link the core game and this is probably the most coherent story yet -- which should please those of you who hated how cryptic past zombie modes were. One of the cooler bits is how you'll start off practically naked, and you'll have to find the Exosuits eventually, granting you the power to jump and dash around. But with your added maneuverability the enemies will have the movement to match, so you won't be able to just kite dumb zombies around constantly. There's also a lot of cool elevated areas to visit. I love the future theme, and even if the Mystery Box serves the same function as it has in the past, it's neat to see it represented as a 3D printer. Plus, all of those new wonderful laser toys are great for blasting zombies, and they don't feel out of place like they did in the past. 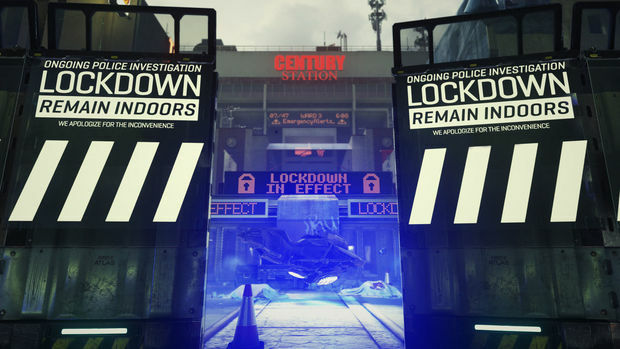 Zombie modes have the tendency to come out of the gate slowly, and although the first map doesn't have any real "out there" concepts, it's more than enough for those of you who still want more of the undead. 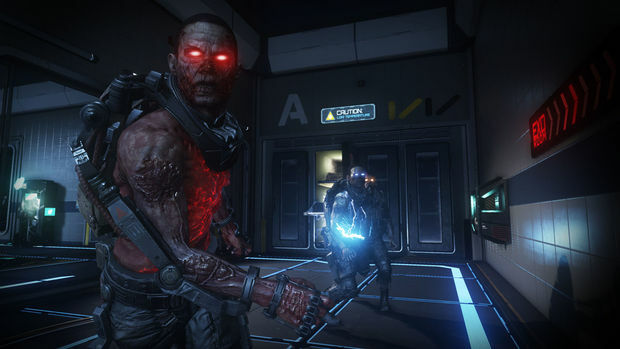 The maps alone in the Call of Duty: Advanced Warfare Havoc DLC are an average affair, but Exo Zombies rises this package slightly above the cut. I love the new cast, the Exosuits makes a world of difference, and I'm digging the Hollywood cheese of the story.